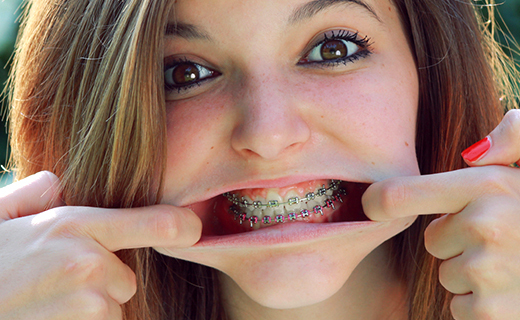 Countless people have experienced stunning transformations by wearing braces. The straight, beautiful smiles that result make any temporary convenience or additional dental care requirements more than worthwhile. If you currently wear braces, or plan to in the near future, the following tips can help you truly enjoy life while undergoing your orthodontic treatment. When you first get your new braces, you may experience a sore mouth and teeth, and it may be uncomfortable to bite into food. To relieve discomfort, rinse with warm salt water and take an over-the-counter pain reliever. If your cheeks, lips, or tongue are irritated from the braces, you can use the wax your orthodontist provided to help ease the pain. If a wire becomes loose and irritates your mouth, use a blunt tool to gently push the wire back into place. Use wax to prevent further injury to the inside of your mouth and visit your orthodontist so your braces can be checked for damage. Most people wonder what foods they can eat when wearing braces. For the first few days, eat soft foods as you adjust to your orthodontics. You likely will be able to resume eating most foods sooner than you think, but remember to avoid tough cuts of meat, hard bread, chewy candy, popcorn, nuts, and crunchy fruits and vegetables. Brushing thoroughly is essential when you wear braces, so be sure to maintain a strict dental care regimen. Braces create areas that can trap food and lead to tooth decay and plaque buildup, so brush carefully and regularly. You must take good care of your orthodontics to get the results you want from wearing braces. Always wear the headgear, rubber bands, and retainers your orthodontist prescribed, and if you are an athlete, wear a mouth guard to protect your bracesâ€”and your mouth and teeth.